Nobody likes error messages, especially iTunes error 0xe8000084. They can make you feel like trashing your PC. Before you trash that PC though, read this post to the end. We provide you with some useful tips on how to get rid of iTunes error 0xe8000084. A damaged USB cable or port that makes it difficult for iTunes to recognize your device. Your iTunes version could be outdated so your iPhone or iPad becomes incompatible with it. Poor network between your iPhone or iPad and iTunes. Conflicts between processes running in your system background. Whatever the reason for iTunes error 0xe8000084, you can easily get rid of this error and in this article, we show you how to solve it for good. Before you try the following tips, try another USB cable or port to exclude hardware problems. Instead of going through all the stress of manually trying to fix iTunes error 0xe8000084, you can simply get rid of the error for good, with one click. All you need to do is trust iMyFone TunesFix. TunesFix is a great iTunes repairer that can fix all iTunes issues and errors easily. The unknown error 0xe8000084 is just a small case for TunesFix. So run TunesFix, and get your iTunes fixed with extra ease. Repair iTunes Connect Errors, like iTunes could not connect to this iPhone, error 0xE, invalid response, value is missing, etc. 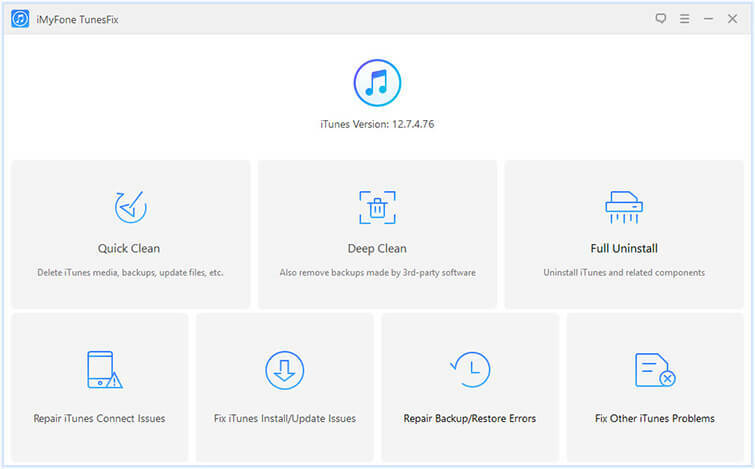 Fix iTunes Install/Update Issues, including error 2503, 2, 127, 126, iTunes/iTunesHelper was not installed correctly, Apple Mobile Device Service failed to start, insufficient privileges, etc. Solve Backup/Restore Errors, such as error 14, 3194, 39, 3212, 2009, 3004, etc. 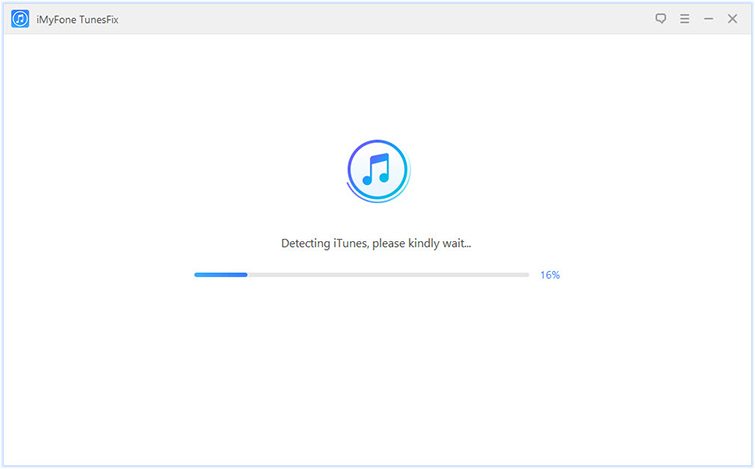 Repair Other iTunes Problems including error 1004, 1611, 4005, 3014, 9006, iOS update errors, iOS restore issues, etc. Step 1: Launch iMyFone TunesFix and it will automatically detect your iTunes and necessary components. If your iTunes or components are damaged, you can choose to repair it. After repairing, please check your iTunes can connect to your iPhone or not. If not, follow the steps below. Step 2: Then you will be directed to the homepage. On this page, you can see all the options available to fix your iTunes issues. Click “Repair iTunes Connect Issues” mode. Step 3: Click on “Repair” to start the process. Once this is done, your iTunes will work properly. With iMyFone TunesFix, you can also clean iTunes data to release space and improve iTunes performance. Clean Junk: Clear up useless files from iTunes to release huge space and speed up iTunes, including cache, cookies, logs, temporary files and other junk. Remove iOS Backups: If you use third-party program for iPhone, lots of iOS backups would be secretly left on your computer. 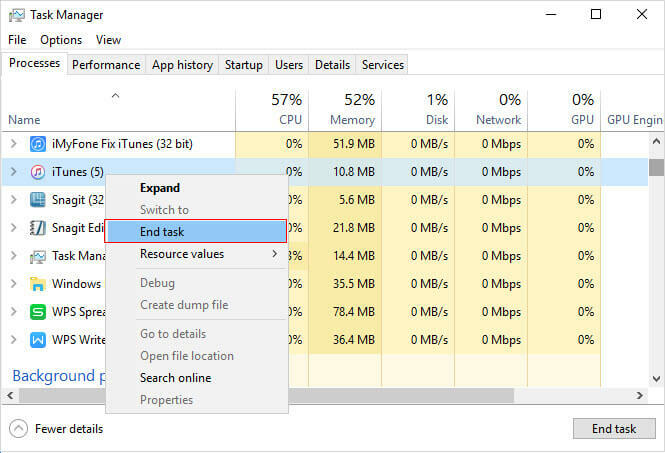 Run TunesFix to delete old backups made by iTunes or 3rd-party software, selectively in bulk or all at once. Delete Used Software Updates: It allows you to remove software updates left during iTunes update or iOS updates. To fix “iTunes could not connect to this iPhone an unknown error occurred 0xe8000084, you can also try to completely uninstall iTunes and its related software components, and then reinstall the latest iTunes. 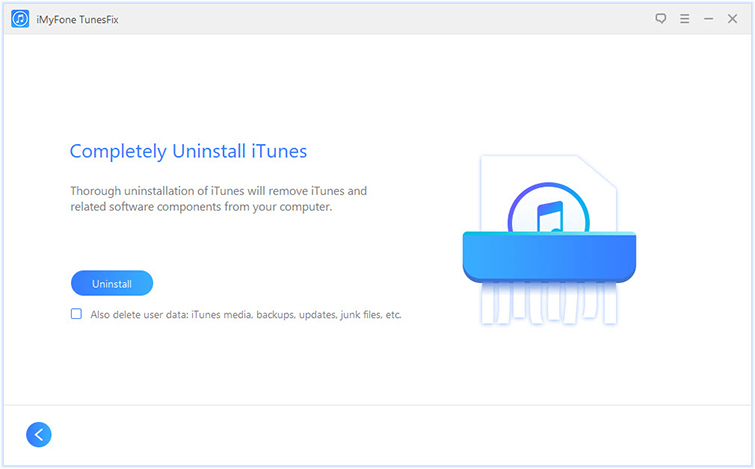 You can make uninstall iTunes and components one by one manually, or you can take advantage of TunesFix. Its “Full Uninstall” gets all the manual uninstall jobs done in just one click. Step 1: Launch iMyFone TunesFix and it will detect your iTunes automatically. Step 2: If your iTunes is not damaged, you will be in the Home page. Click “Full Uninstall” and tap “Uninstall” button to let it start. Once done, you can tap “click here” to install the latest or old version of iTunes. Step 1: Connect your Apple device to the PC and quit iTunes. Step 2: Pressing “Alt + Ctrl + Del” keys on your keyboard at the same time and choose Task Manager. Step 3: Once Task Manager is open, sort the processes by Image Name and kill every process that starts with “Apple”. In order to kill a process, simply right click on the process and select “End Process” or “End Task”. Make sure to end the “AppleMobileDeviceHelper.exe” process in order to complete this step. Step 4: Open the Run command by pressing “Win + R” keys on your keyboard at the same time. Step 5: When the Run command appears, Copy and Paste the following command in the text box. If your operating system is 32-bit, copy and paste this command: “%ProgramFiles%\Common Files\Apple\Mobile Device Support\AppleMobileDeviceHelper.exe”. Step 6: Open iTunes once this is done to check if the error has been fixed. Usually, once you follow these steps correctly, you would find that error 0xe8000084 is fixed totally. However, it may not end how you want it to. The error may still remain and the method is only great for you if you know your way around a computer. If you don’t, proceeding may be a bit difficult.